...Enjoying Life...: Refresh Your Alcohol Markers Blog Hop + Giveaway! Refresh Your Alcohol Markers Blog Hop + Giveaway! I'm so happy and excited to be a part of the Altenew, Artist Marker Refills blog hop! Welcome to my stop on the hop. I'm so glad you're here! You should've arrived here from my wonderful, sweet and talented friend, Virginia's blog. If you'd like to start at the beginning of the hop, click here to be taken to the Altenew blog. Let's take care of some business first and then I'll share my cards with you. Altenew is giving away a $30 gift certificate to six lucky winners! Please leave a comment on the Altenew Card Blog and/or Altenew Scrapbook Blog by Wednesday, September 26th, for a chance to win. The six winners will be announced on the Altenew blogs on 9/29/2018. Wait - that's not all! Altenew is generously letting me give away a $20 gift certificate too! To enter to win, just leave a comment below and I will randomly choose a winner from all the comments and announce that winner here on my blog on September 26, 2018. 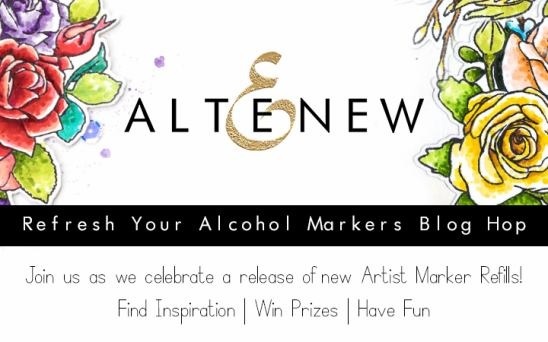 And to celebrate this blog hop even more, Altenew is running a marker sale! Save 15% off on All Artist Markers from 9/20/2018 at 12:01 EDT until 9/22/2018 at 11:59 PM EDT. No code needed to enjoy this sale! (Excluding refills and brush nibs.) Not valid on previous purchases. Okay, I've created two cards for today, using both the Artist Markers and Artist Marker Refills. All products used are listed below, in the affiliate links, at no extra cost to you. My first card uses bold colors to create a cool background with the Artist Marker Refills. They work beautifully on Yupo Paper! I just added a sentiment strip and the card was done. I used softer colors on my second card for a wispier background. I colored the flowers with Artist Markers and as with my first card, the background was created using the Refills. I popped up the flowers and added the sentiment strips to finish the card. 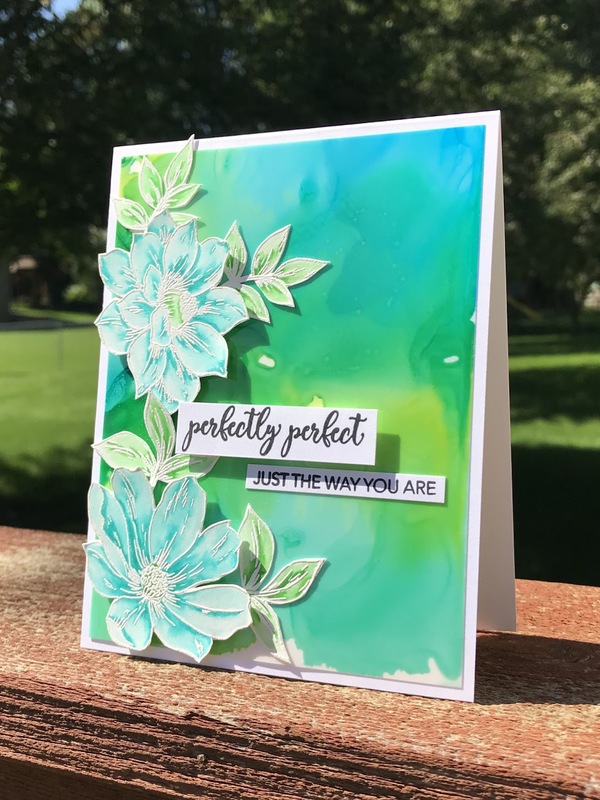 I hope I've inspired you and given you some ideas for using Altenew's Artist Markers and refills! 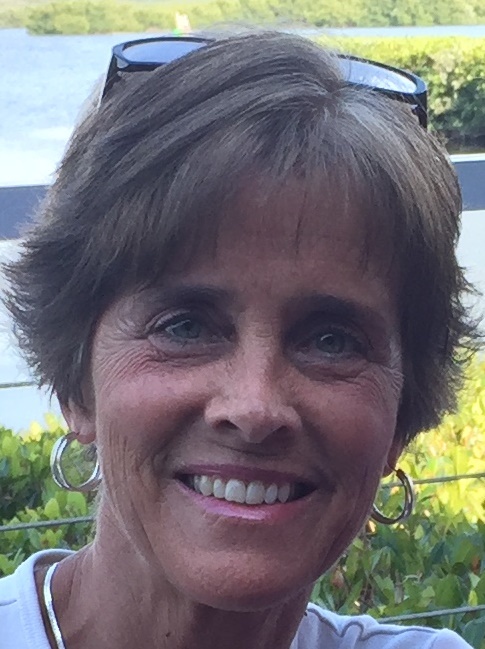 The next stop on the hop is Enza Gudor at her blog, Creative Findings. Love the vibrancy and mouvement in those backgrounds. I really love your alcohol backgrounds. They are just gorgeous and you put the perfect colors together. I love both of your cards - such a versatile product! BTW: I love the packaging, too...makes me want to buy them! Beautiful cards! I love how vibrant your first card is and it really has movement! I also love the softness of your second card and the flowers are gorgeous. Barb, your refill color combos are gorgeous but the way the marbling came out is stunning!! The details you added just accented their beauty!! Love them! Both cards are fabulous. I love the things you can do with these alcohol inks. I love the colors used on the 2nd card, and the beautiful design. Great cards! That first one is really bold! And the second one is soft and beautiful! Thanks for the inspiration! I love your "perfectly perfect" card, very elegant and beautiful. 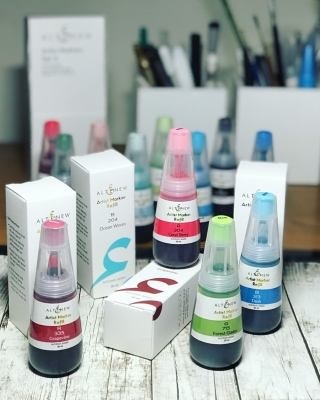 I really like that Altenew put the ink color on the top of the bottle so you can see what the color is without having to pick them up to see the label. Thanks for sharing and the inspiration. Alcohol ink is so much fun to play with! Great cards. Love the movement in the first, and the softness in the second. Thanks for the inspiration! Love your sweet cards! Great projects with those amazing colors! 2 excellent backgrounds. Normally I am drawn to b/g, but I am loving your first combo more! I love the backgrounds that you made for these cards I never thought about using ink refills that way. I don't own any of the markers but I would love to get a set in the near future. The colors are SO RICH and vibrant! Gorgeous! Great cards - love the use of bolder colors for the backgrounds. These cards are just lovely, Barb! Thanks so much for convincing me to get the refills! Love the options of how to use them. Lovely backgrounds Barb! Refills are definitely must haves! Thanks for the inspiration! Stunning Barb. The backgrounds are simply gorgeous. The second one is so delicate looking and is the perfect foil for the flowers. Love your backgrounds, especially the second one. The second one has the cool colors I love. Beautiful cards!! Both of these cards are spectacularly beautiful! Love them both! love both of your cards - the backgrounds are superb!! Wow, amazing alcohol backgrounds and perfectly stunning cards! Both of your cards are beautiful! I like ve the way you made your own paper for them, and kept them simple so that it was the shining star. that is neat packaging. they look like little elves, those bottles. and your cards are lovely as always. i'm glad i found your blog. Very pretty flower set you've used and I like the layering as well. Very dynamic. Your cards are fantastic ! I specially love the colors of the second card as well as its sentiment which is really great. Both really nice cards! My favorite is the second one. Oh ba4b , they are both amazing and extra elegant. The "perfectly perfect" card is Perfect! Great cards and backgrounds. Especially like the brighter one. Thanks for sharing. Beautiful cards. Love the stunning backgrounds. Your backgrounds are so rich and lush! 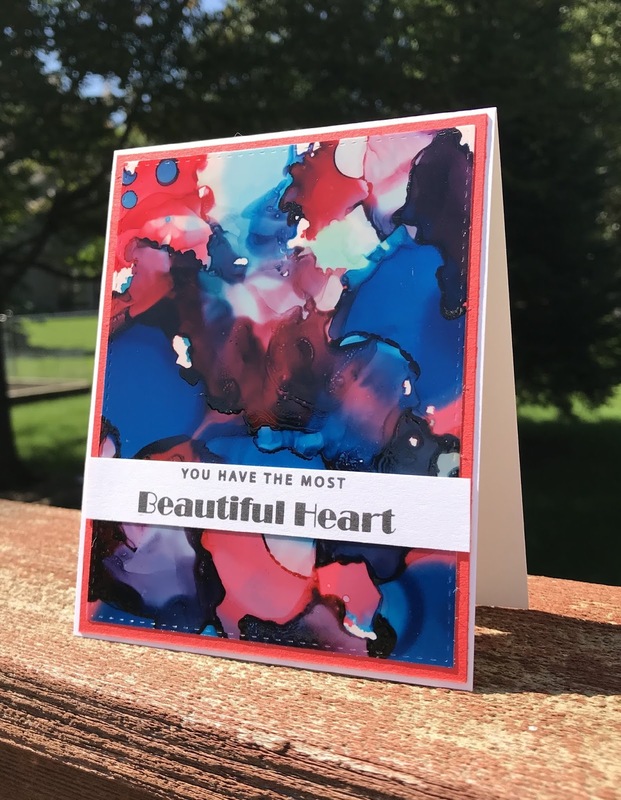 I love that beautiful, bold blend of color that make your cards look amazing! Love the one with the greens and blues!! When i saw first card,i was like woww and when i saw second one i was like woowwww,beautiful cards..Thanks for sharing and inspiring! Beautiful colour combinations used, very funky & modern, really unique which is the great thing with yupo & alcohol marker fluid. That red, white and blue background is so pretty! Reminds me of the 4th of July. Your other card is very pretty also. I like your wonderful backgrounds. Thanks for sharing. I especially love the second card, the colors and design are simply beautiful. Love the intensity of your backgrounds!! Beautiful cards!! These are both very pretty, but when I saw the second one I started oooo-ing like those little aliens in Toy Story. That is such a pretty look to color the flowers with the same marker colors you used to make the background. Thank you for sharing with us! Really gorgeous cards! Love how versatile the new marker refills are! just mesmerized by the movement created by alcohol inks. these backgrounds and completed cards are great! Both are beautiful, but oh my goodness--how I love the second card, Barb! I've got to practice with my alcohol inks as my backgrounds never look like this!